RD8100 systems are shipped as standard configured to use D cell alkaline batteries. Both the locator and transmitter can also be powered using good quality rechargeable D-cell NiMH batteries or the optional accessory Li-Ion rechargeable battery packs. It’s important to set the correct battery chemistry in the locator to optimize performance. Transmitters can also be powered using optional accessory mains or vehicle power adapters. 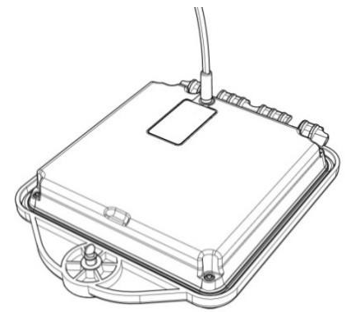 RD8100 systems are shipped with D cell battery trays. Suitable alkaline or NiMH batteries should be fitted in the battery compartment before your first use. Insert 2 × good quality D-cell batteries. 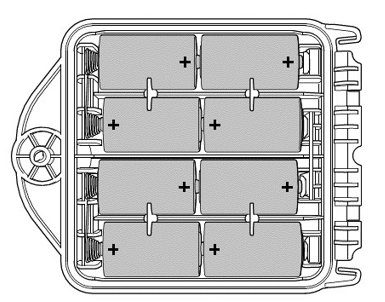 Note the polarity of the cells when inserting them in the battery tray. To fit the D-cell batteries in the transmitter, unlatch the accessory tray. 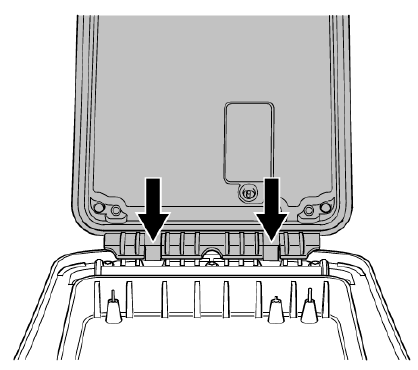 The battery compartment is located underneath the transmitter body. 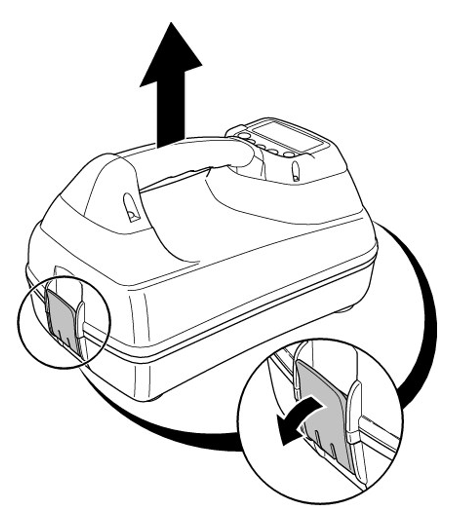 Use the turnkey to unlatch the battery compartment. Insert eight D-Cell Alkaline or NiMH batteries. The locator and transmitter displays provide a battery level indicator. When battery replacement is necessary, the display shows a flashing battery icon. NOTE: Prolonged use of high power output on the transmitter will reduce battery life. 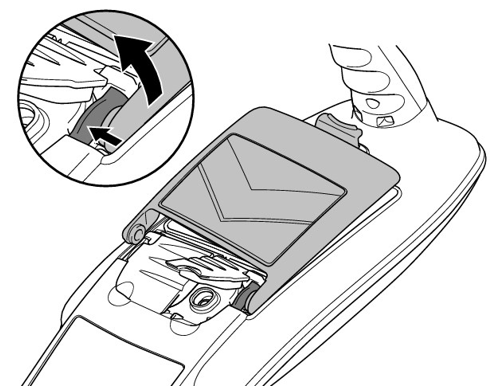 Open the battery compartment using the release catch. If using a Li-Ion battery pack un-plug the lead connector. 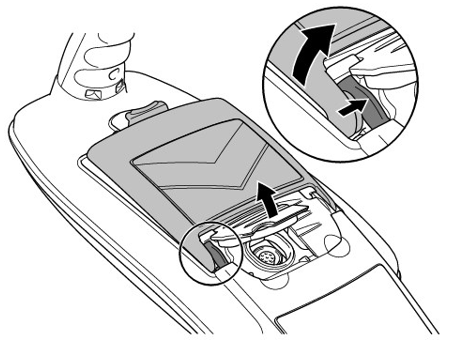 Lift the accessory cover slightly and press the battery retaining latch inwards. 4. 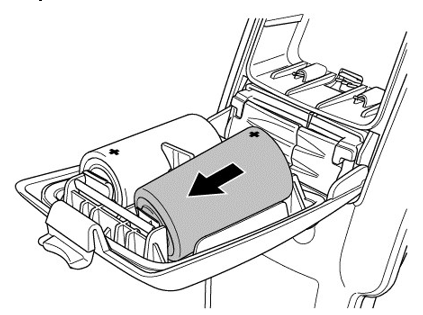 Rotate the battery pack away and up from the latch. 5. Repeat on the other side to release the battery pack completely then lift the battery pack away. 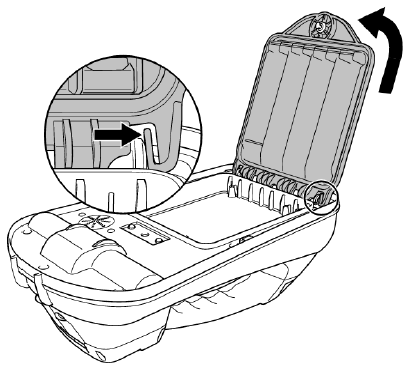 To fit a new battery, lift both accessory covers slightly, then gently push the replacement pack into place until it clicks on both sides, then close the battery pack. If using the Li-ion battery pack, plug the lead into the battery connector. NOTE: Fully charge your lithium-ion battery pack before its first use. 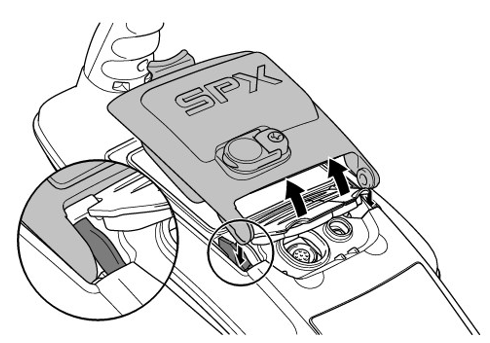 Unlatch then remove the accessory tray. 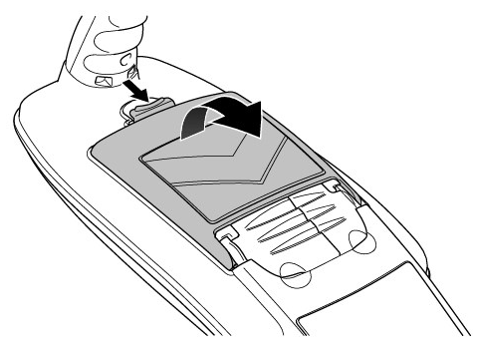 Turn the release catch, then open the battery compartment. 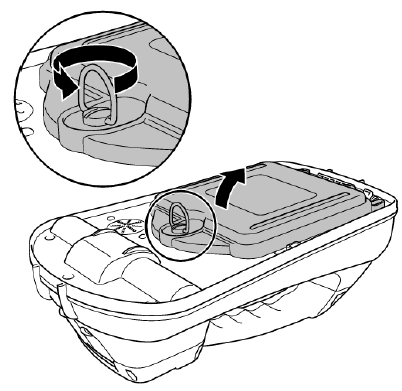 Release the retaining catch by pressing gently, then lift the battery pack away. Line up the battery pack clips with the corresponding recesses on the transmitter body and press into place. 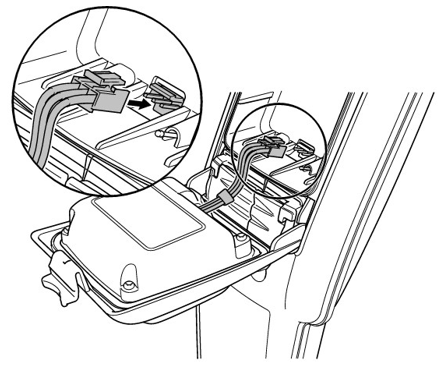 Close the battery pack, turn the retaining latch and replace the accessory tray. WARNING! do not heat the rechargeable battery pack above 60°C (140°F) as this will damage the battery's thermal fuses. To recharge the locator battery pack, connect the battery charger to the DC input connector on the front of the battery pack. 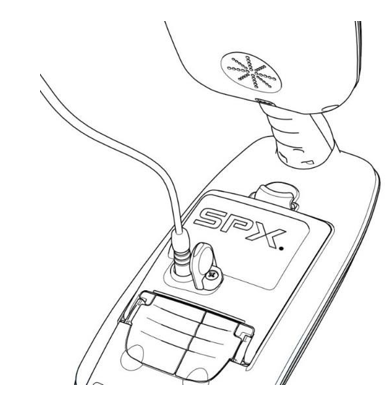 To recharge the battery pack, remove the pack from the transmitter and connect the transmitter battery charger. For more information about recharging batteries refer to the instructions that came with your charger.